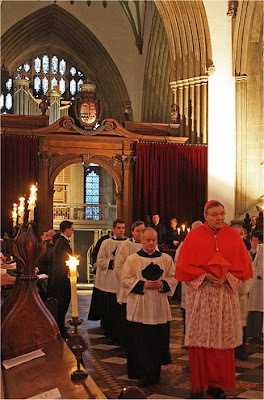 Last night I assisted Cardinal Pell at Vespers, sung in the Chapel of Merton College. His Eminence is at Oxford for a few days and delivered a major lecture arranged by the Oxford University Newman Society. After Vespers, there was a dinner at Keble College and I was able to catch up with many good friends. This morning was gloriously sunny and I had enough time before leaving to say some Office while walking in ChristChurch meadow before taking the train back to prepare for the weekend in the parish. There will be some more photos and a link to the Cardinal's address quite soon.